Working for a Bank at Wall Street was all I could ever dream of during my studies. I joined one of the big banks and went up the ladder, becoming responsible for the mortgage department. Due to the financial crisis, many people fell behind in paying their debts and we are obliged to repossess the houses. I just read the last report with the numbers. More than 1000 families will be evicted tomorrow from their houses. All of a sudden I felt like I had received a punch in my stomach. Memories of my childhood haunted me and made me taste the bitterness of guilt. My school was one block away from my house. My friends liked to drop by after classes before heading to their homes, farther than mine. We liked to play football with the older kids from my street. They taught us new tricks, new slangs and curses. It was so cool. I was like one of them. I loved playing with the older boys next door, when visiting their parents during vacations. They were the sons of the Pauley’s family, who lived just across my house. I heard my mum saying often that Mr. and Mrs. Pauley were very good people. They were very religious and could be considered the representatives of God on earth. My mum said funny things sometimes. I never really understood that comment but I think she meant to say that because he was the priest of our church. I didn’t know Mr. Pauley very well; I was a bit afraid of him, though. He had so much hair in his eyebrows, and a deep scar on the right side of his face. He looked like a horror movie character. I could never understand his words when he spoke long sermons on Sundays. All I could think of was: “when is this going to end”, as I wanted to play football with my friends. Mrs. Pauley was different though. She was a very kind and soft-spoken woman. I liked her. Sometimes when I walked back home from school together with my friends, if she would be outside in her garden, she would offer chocolate to us. I think she loved chocolate as much as we did. She would ask about my progress at school but also about my sports. She knew how to talk to kids. I felt at ease with her because she would ask my opinion about football. No other adult had ever asked me what I think. If I were born again, and if I could choose, Mrs. Pauley would be a nice mother for me. “My mum is a good mother; I’d better not say that to her, as she may be upset with me”, was a thought that crossed my mind. She liked Mr. Pauley though, and they were best friends, so I thought that maybe mum would not be mad at me. It was late night when I heard mum answering the phone and rushing to wake up my eldest brother, who shared the bedroom with me. Mum was speaking softly and low but I heard when she asked him to drive her to the hospital. “Go back to sleep. I’m fine. I only need to help the Pauley’s, as Harold is unwell. We’ll be back soon,” said mum. When I woke up I found out that Mr. Pauley had passed away that night. I was very sad for Mrs. Pauley and for her sons, but much more for her, as she was going to live alone from now on. I haven’t seen Mrs. Pauley for 6 months. They said she was ill since her husband’s death. I asked mum but she told me to get back to my studies. I missed talking to her though. She was like a friend even if she was older. “Mum, maybe I could help Mrs. Pauley be happy again if I tell her some jokes?” I tried to convince my mum, but she nodded in disapproval and walked away. I thought that mum didn’t want to talk with me about Mrs. Pauley sadness, because she lost her husband as well. Dad died when I was only two years old. I noticed that she was sad when she talked about him. As I walked back from school, surprisingly, I saw the landlord and a policemen talking to Mrs. Pauley’s at her front door. I sat on the stoop across the street trying to eavesdrop their conversation. I was happy to see her after many months but couldn’t avoid noticing that she was speaking loud and crying. “Has another tragedy happened? Maybe they are here to say that one of her sons died!” these were the thoughts racing in my head when I ran to tell mum what was going on outside. I spoke so fast that mum could hardly understand me. I grabbed her arm and pulled her to the sidewalk. The men were leaving. Mrs. Pauley looked at us, in a mix of disarray and sadness, and slammed the front door, as we ran to reach her. Mum and I knocked the door until she opened it. She was crying desperately. My mum embraced her. She looked so frail, thin and pale! “What is happening, Rosemary, why are you avoiding me all these months, and what was the police doing here? What is happening?” said mum with exasperation. “My life has ended, Ingrid, since Harold died. Our sons are grown ups and live far away from me. They are happy starting their lives and I couldn’t tell them that Harold had a secret life and a second family. He had debts that I wasn’t even aware of. I used all our reserves to give to the creditors but nothing was left to pay the rent. Today was the end of it. I am broke and need to give the house away. I don’t want to live anymore”, said Mrs. Pauley, speaking with a calmness that scared me. I couldn’t hold my tears anymore and ran to also hug Mrs. Pauley. Mum asked me to go home and once I was there I shared everything with my brother. Later she arrived bringing Mrs. Pauley with her. Mum announced that she had invited Mrs. Pauley to live with us for the time being. I was teary again when hearing the news. In the following day, mum invited all neighbors to help temporarily storing Mrs. Pauley’s belongings in their shelters until her situation was solved. Everyone helped. No one seemed to know what was happening in her life. She was too ashamed to ask for help. One of our neighbors was a rich businessman. He offered a job to Mrs. Pauley as a secretary. She accepted it promptly as she could after a while rent a house again. I was sad to see her leave but I knew that she would be happier again if she could have her own place, and for her sons. After a few months, mum and the neighbors organized a big lunch at the church to celebrate Mrs. Pauley’s birthday. She didn’t know of that surprise, nor that her sons were invited too. Till this day, 30 years later, I never forgot that day. Mum taught us all what unconditional love and compassion is. Not only she showed me, but the neighborhood, that despite their differences, they could unite as one, to help someone in need. I looked at my mum with pride. She was my heroine. If she would be still alive, she would be ashamed of me today. I put my pen down. I just signed my resignation letter. I really enjoyed reading your version of this story, you’ve made it so personal:) I loved how some scenes are so similar with mine, like neighbours coming together to help, Mrs. Pauley’s love for chocolate. I can’t see your personality shining through these words and I think we share the same values, always trying to see the good in people and situations. Thank you for reading, Julia! This was a long one! I had tough time as I’m not fond of writing stories. I’m at ease with story telling. To conquer my concerns I thought of some life situations and people I knew, and mixed their experiences in one story. The love for chocolate and a kind neighbour feeding the kid, is me! We do share the same values and isn’t that wonderful? So glad we met here. Have a nice weekend and thank you so much for bearing with me here. Great story, love the twist you put on it using a flashback. And it’s nicely heartfelt as well. I appreciated that you read it though. Thank you! This is wonderful, a perfect and faithful response to the prompt and the way you write, it sounds so true. Beautiful. Hey Andy, Thanks! I thought could not pull through this prompt. I’m glad is over! My pleasure as always, and yes, I concur! Thanks for dropping by Ranu. I appreciate your visit and comment. Great story Lucile! Very touching. Oh, Lucile! What a winner you have here! That Harold–ugh! What a scoundrel. So love the turn around ending, though. Not a boring story for me at all! Haha he’s a scoundrel indeed. Thanks much for bearing with me and even liking this pots. I struggled a bit to get it done. Not my comfort zone. Thank you, Janet. Indeed, it fits well with Mother’s Day. Wow, just wow, Lucile! An excellent piece of fiction with a great back story and twisty ending. Best one of the W101 prompts I’ve read! YOU should write fiction–this was fantastic! It created an unexpected emotional response in me as a reader! Extremely well-done!! Terri, you really spoil me with generous comments. I cannot possibly entertain myself with fiction as I don’t like it, let alone writing it. Maybe this helped me to put an extra effort as I really has a tough time to get started. I try not to be my worst enemy but I admit I’m hyper critical. I dared to try and that was great. I learned a lot. But I’m not into fiction. I’ll read yours and give you my feedback. With pleasure. Well, that was really nice. Well put together. It created empathy for the characters. Really nice job. Excellent, Lucile! It flowed and put you right into the story. It was very heartwarming how it turned out and Mrs. Pauley was taken care of, beautiful! Thanks, Barbara. You cannot imagine how much I struggled to write this one. I postponed till the last minute. Glad you liked it. I read your story today with eager anticipation how Mrs. Pauley would survive! It was a riveting tale and especially the end about the resignation letter! Well done! Perhaps you’ll write a Part 2? Lia, you’re too kind.I truly struggled to write this one and was happy when it was over. Part two would be wishful thinking as Im not good at writing fiction. Thank you so much for the encouragement though. You’re sweet! I’ll think about it just for you! Hugs my dear! 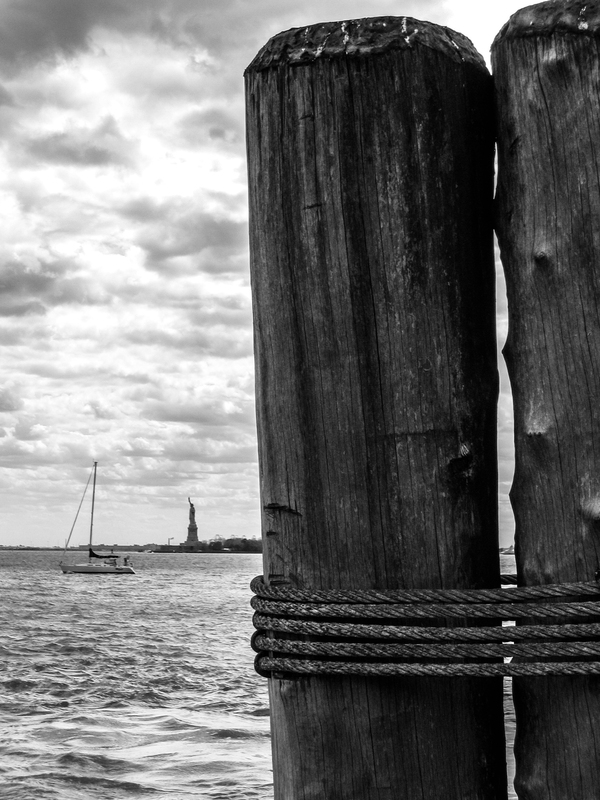 PS I like the Lady Liberty photo you featured here! Wonderful that you noticed. The photo was carefully selected to symbolize freedom x wall street. It was a great choice of photo :)))) Thanks, you rock too, my friend! I think it is! This lady is an imposing sight of the city!